The photo of Elian, now 16, wearing an olive-green military school uniform was taken at the Young Communist Union congress. Many of you may know the story of 5 year-old Elian who was found floating off the Florida coast in an inner-tube after his mom and other's drowned in their attempt to reach the States. Well he was taken in by family in Fl who refused to give him back to his Dad who was still in Cuba. 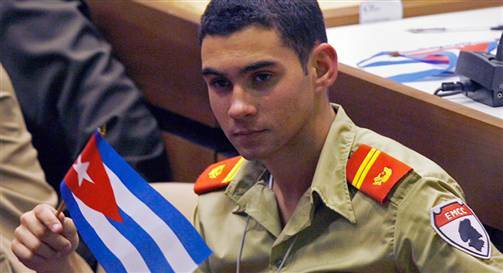 The American immigration officials ruled that he shoud be returned to Cuba... Boy dem Miami people was blue vex. I remember all the hoopla surrounding him. Anyhow. Federal agents came and forcibly removed him and reunited him with his father Juan. When he returned to Cuba his dad got a seat in parliament. The Cuban government celebrates his birthday every Dec. 7th. In 2008 he formally joined the Young Communist Union. I wish him all the best. He will no doubt go to University in Cuba and be well-educated. Cuba has some of the best doctors in the world, many of whom have trained regional doctors and lent their expertise to many islands during times of disaster, including Haiti and even Thailand.